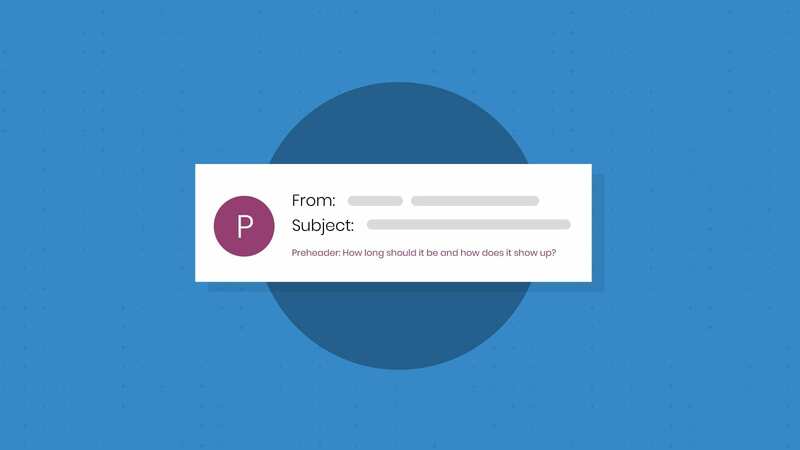 Email campaigns can accomplish so much more than increasing brand recognition or boosting your company’s bottom line. At the end of the day, email is a channel where you can communicate on a personal level to millions of people around the world. 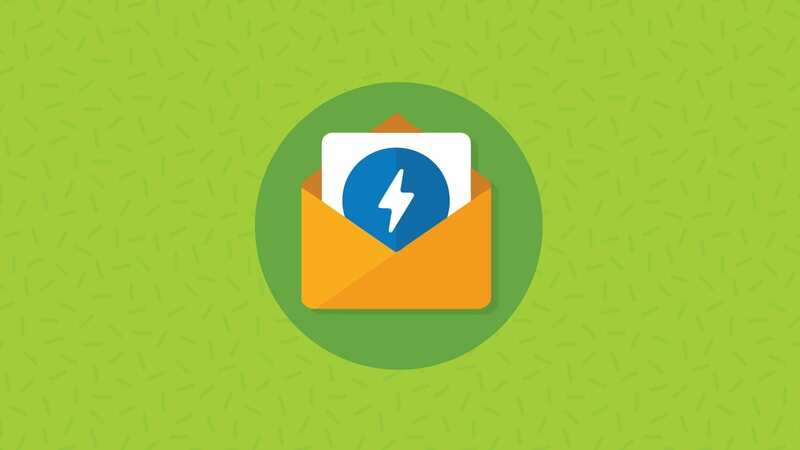 As the holiday season approaches, we wanted to highlight seven companies that are using their email marketing channels for good. 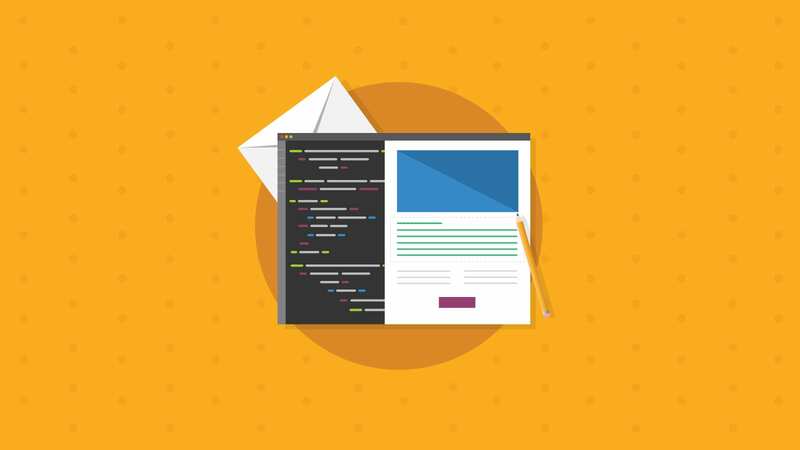 Whether it be giving back to the community, or donating a portion of their proceeds, here are seven standout email campaigns that use the one-to-one communication medium to make a difference. HSN celebrated 9 years of supporting Saint Jude Children’s Research Hospital by selling a designer ornament selection. This specific email (pictured below) allowed you to donate directly to St. Jude’s or purchase a limited edition ornament where 100% of the profits funded the research needed to save the lives of children. While it can be effective to simply ask for a donation, the approach of pairing gorgeous ornaments with the holiday season makes the reader more eager to act as they simultaneously give and get. A nice ornament for the holiday tree paired with the satisfaction that their purchase could help find a cure. Subtle and brilliant, all at the same time! ONA executed a beautiful and compelling email campaign to help the nonprofit charity: water. In the email below they offer a Sahel strap to all their photographer junkies of which a portion of the proceeds will bring clean water to millions of people currently living without it. Note also the use of the hashtag #GIVINGTUESDAY at the top of the email. Giving Tuesday is a global day dedicated to giving back. 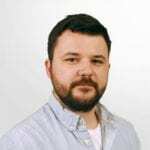 By incorporating this day of generosity in the email paired with a trending hashtag, they got more eyes on the offer to raise both awareness and funding for a fantastic cause. Speaking of charity: water, this organization pulled off a well-designed solo fundraising campaign for the holidays, as well. From their fun wordplay with “Jingle Wells” to their touching graphics, this is a top-notch holiday campaign that gave back to countless individuals and communities around the globe. In addition to this being an amazing cause, the copy is compelling, too. Their content marketers took care to elicit emotion through their text as they explain that the amount Americans spend on gifts each year is enough to solve the water crisis several times over. They also easily break down how $5,000 could get 250 people water. The emotional copy, tied with the practical math make this an excellent campaign from start to finish. 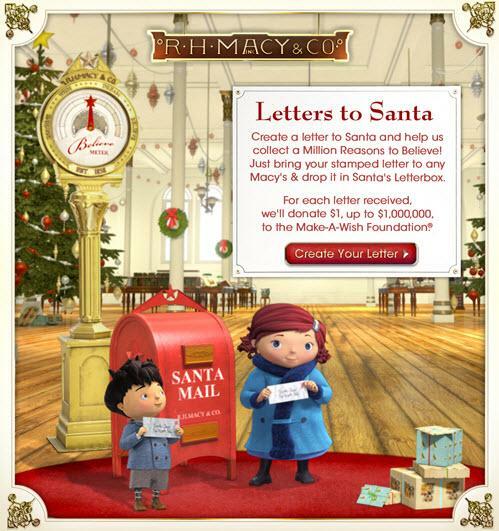 Macy’s appropriately themed holiday campaign called “Letters to Santa” asked kids worldwide to write a letter to Santa to collect a million reasons to believe. Not only is this idea insanely cute, but Macy’s also donates $1 to the Make a Wish Foundation for every letter they receive. This campaign is called “Believe” and it’s the eighth year they’ve teamed up with the Make-A-Wish foundation to help spread holiday cheer to children with life-threatening medical conditions. This campaign will not only bring joy to children that could really use it, but also lets kids embrace their imagination for a good cause. TOMS has always given a pair of new shoes to a child in need for every pair purchased, but for the holiday season they put a seasonal spin on the “one for one” message. In the past, their shoes only accommodated a certain (read: warmer) climate and terrain. In this campaign, they are giving warmth and hope by designing their very own winter boots line to keep children’s feet warm and dry in cold-weather climates. A gift of Nepal Boots from TOMS now yields a pair of winter boots for an individual in the United States, Eastern Europe, China or South America. IKEA spreads holiday cheer and goodwill with a focus on giving to children. In the campaign featured below, IKEA promises to donate $1 to children’s education through UNICEF and Save the Children for every toy or book purchased. According to the email, the Soft Toys for Education Campaign has reached more than 11 million children since 2003. Who wouldn’t want to give a toy to a child they love, knowing that through that gift, another child will be one step closer to receiving the education they desperately need? On top of this email having a killer holiday design, it also gives back to shelters in Dayton, Ohio through the local nonprofit St. Vincent de Paul, no strings attached. 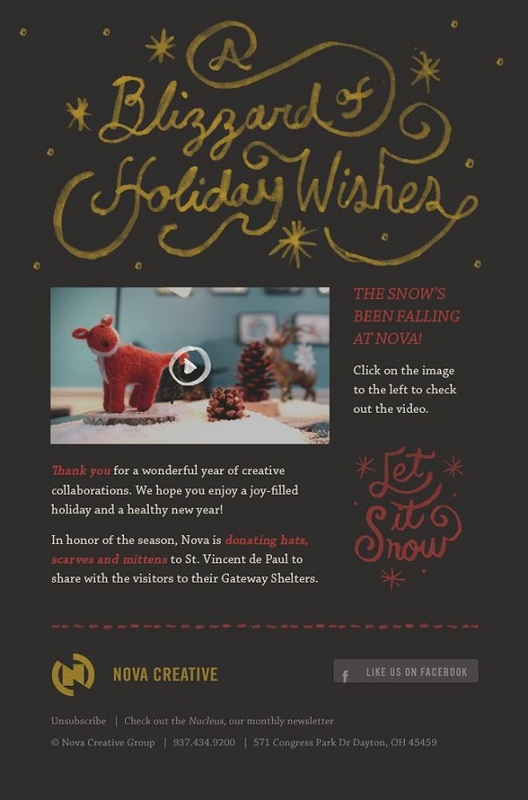 The video is fun and the copy offers warm holiday wishes while noting that NOVA CREATIVE has donated hats, scarves and mittens to help those in need stay warm for the holidays. And the email doesn’t ask for anything in return, giving us a holiday-sized dose of warm fuzzies. Did we miss any campaigns spreading holiday cheer? We’d love for you to share any email campaigns that you’ve seen giving back to the community in the comments section below. We want to tip our hats to the companies sending these campaigns and also get the word out about offers that could help those in need this year.